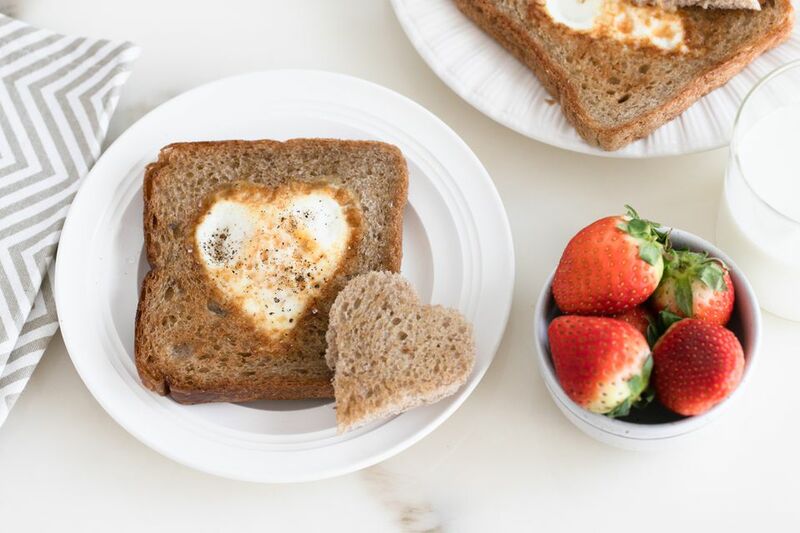 Eggs in a basket, also called "eggs in a nest" or "toad in the hole," is a surprisingly quick and easy breakfast. Kids can even make this eggs in a basket recipe themselves. Heat an electric griddle to 350 F or heat a large frying pan over medium-high heat. Place 1 teaspoon of butter on the griddle. Use a cookie cutter to cut out your favorite shape in the center of each piece of bread. Butter 1 side of each piece of bread, including the cutout pieces, with the remaining butter. Place the bread, butter-side down on the griddle. Break 1 egg into a small dish. Gently slide it into the hole of one of the bread slices. Repeat with the remaining egg and bread slice. Cook until the egg is golden on the bottom, 1 to 2 minutes. Gently flip to cook on the other side, about 1 minute. Flip the cutout pieces of toast to cook on the other side until toasted, another minute or so. Salt and pepper to taste and serve immediately and enjoy!